When I was around 16 and having visited Israel as part of a Zionist Federation programme aimed at school students, I ‘came out’ as an anti-Zionist. There were a whole number of motives - I broke away from the official tour to go to Jerusalem and I made a point of talking to the Arabs of the West Bank and refusing to be blind sided by what was, to me, obvious Israeli propaganda. I had also become a socialist and a Marxist and I found the universalism of these secular heresies incompatible with the Judeo-centric emphasis of Zionism. I had also become aware, I know not how, of the outlines of ‘cruel Zionism’ and how it had supported the maintenance of immigration barriers in Western countries after and even before 1945. I listened attentively to a debate where the Guardian’s Michael Adams (the only pro-Arab journalist then around) had debated with some Zionist flunkey. But in a provincial Jewish community in Liverpool I felt alone. True I had good friends at the local King David Jewish School who were lukewarm about Zionism, especially Mike Goodman who I met up again with in NUS when he was President of Brunel students union and I was Vice-President of Brighton Polytechnic and one or two others who drifted in later years into the far-left. But at that time there was no one Jewish I knew who opposed Zionism who was Jewish. 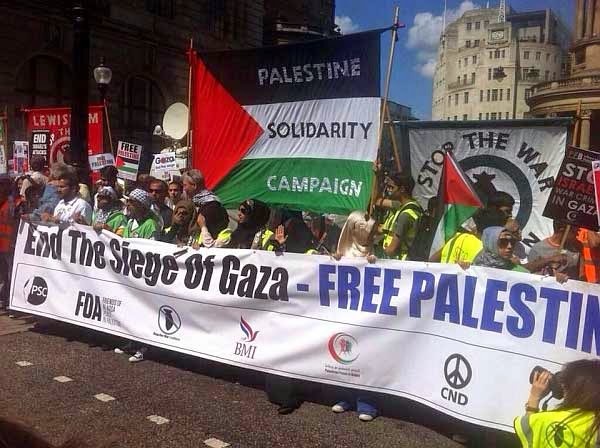 That is why it is a source of much pride to see the proud and assertive Jewish bloc on the Gaza demonstration and people like Barnaby Raine. I could only join it at the beginning for health reasons but thanks to groups like Jews 4 Boycotting Israeli Goods, the Jewish anti-Zionist Network and also softer groups like the Jewish Socialists Group and Jews for a Just Peace for Palestinians, more and more Jews are breaking from their parents unquestioning support for all things Israel. The speech of Barnaby Raine, a 19 year old student from North London, to the rally was magnificent. It says virtually everything that needs to be said about the support too many Jews still give to Zionism, as epitomised by the despicable creatures who contacted the Jewish Chronicle to protest at their carrying a Disaster Emergency Relief advert, when even the killers themselves, the Israeli government, admit there is a humanitarian crisis. 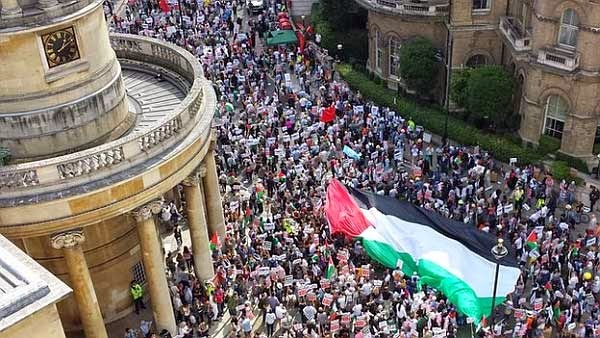 The United Kingdom’s largest demonstration for Gaza has just made history. 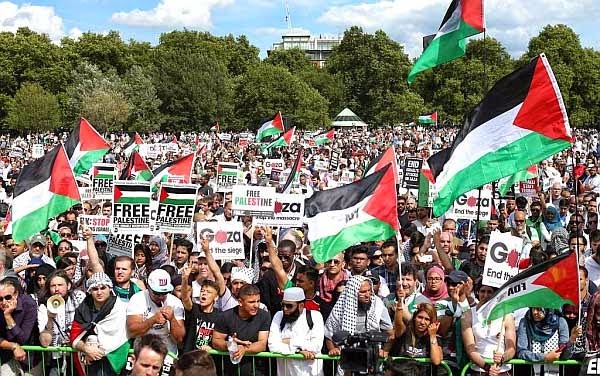 Not only was it the biggest protest in solidarity with Gazan civilians in the UK, but it was also the largest in the world, at any time in history. So many people turned up that when the front of the march reached Hyde Park, the back still had not left the BBC. 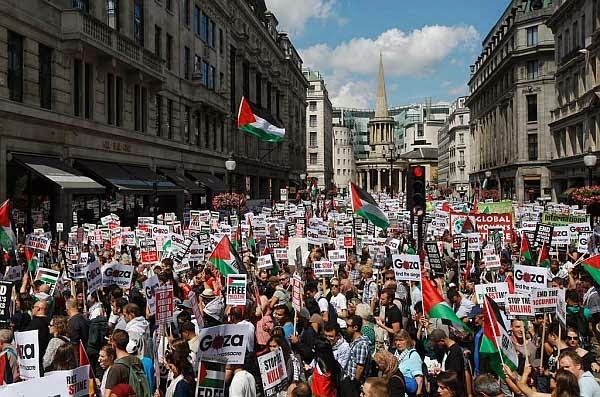 We marched to demand an end to Israel’s barbaric assault on Gaza, to call on the British government to implement an immediate embargo on arms sales to Israel, and to show Palestinians facing Israel’s war crimes that they are not alone. The protest took place on Saturday 9 August. Over 150,000 protestors marched from BBC Broadcasting House all the way to Hyde Park, right in front of the US Embassy along the way.